By food, of course I mean something direct from Nature! Yesterday we were at our local Farmers' Market and we bought ourselves an Armenian Cucumber. Having never had one before we were excited to see what it was like. Farmers' Markets are a great place to explore fruits and vegetables that are new to you, and you have the farmer right there to answer any questions you may have. Well, an Armenian Cucumber taste pretty much like a regular cucumber (maybe a bit sweeter), so this time, our journey into the world of unknown produce wasn't very exceptional. But we still felt great about becoming familiar with a new food that grows in many of the local gardens around here. It is very important to eat a variety of fruits and vegetables and not to just stick with the same few that you are familiar and comfortable with. Our bodies need a range of nutrients and by continually rotating your produce and always adding in new things you will be guaranteed to get all the essential nutrients you need. Buy local, organic and in season and you increase those nutrients several times over. Our Armenian cucumber became the star ingredient in last night's cucumber salad. cuke and the regular old ones, aside from the gorgeously serrated appearance, is the texture of the peel. The Armenian cucumber has a very thin and light tasting peel making it easy to consume the entire fruit (yes, a cucumber is a fruit, not a vegetable). With regular old cucumbers I find myself sometimes cutting that harder dark green peel off, even though I know that it is nutritionally always better to eat the whole fruit and not just part. No problem with these beautiful Armenian cucumbers! 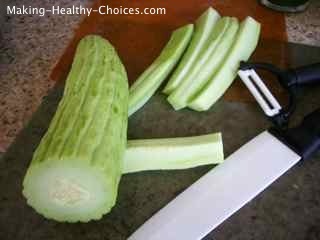 Notice the ceramic knife and ceramic peeler in the picture? Using a ceramic knife and peeler with your produce is a little trick to keep more nutrients intact as things will oxidize quicker when sliced with metal. Whether in your local Farmers' Market or in your grocery store's produce department, I encourage you to be daring and try something new today. Stay local and in season and use your senses as your guide. Fruits and vegetables come in all the vibrant colours of the rainbow. Let your senses guide you to what you are attracted to today (and notice how that changes from season to season). Does it look great to you? Does it smell wonderful? Does it peak your curiosity? Does it make your mouth water? i was looking for and i am looking forward to reading your other posts soon! 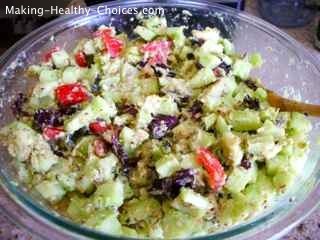 Chop up the cucumber into small pieces and put in a large bowl. From here you can pretty much add anything that sounds good to you. Measurements here aren't important. Add ingredients until your salad looks and taste wonderful. The options are only limited by your creativity. Use your imagination, choose produce with vibrant colours and create your very own salad masterpiece. I have never seen this kind of cucumber before.. looks rather pre-historic, lol. hmmmm maybe it carries with it the ancient wisdom of long ago.